These adorable cups will grab your attention instantly and increase your appetite. They can be filled with any of your favorite fresh vegetables or fruits. Peel and chop cucumbers in small cubes. Keep aside. .
Chop sweet onions and tomatoes finely. Clean and chop cilantro finely as well. In a salad bowl, add chopped sweet onions, cucumbers, tomatoes and cilantro gently. Now add lime juice, chaat masala, freshly grounded black pepper, roasted cumin seed powder, sugar and salt. Mix the salad again. Separate the lettuce leaves gently. Take each lettuce and cut them in 3 inch diameter circular discs. Prepare 4 lettuce discs. 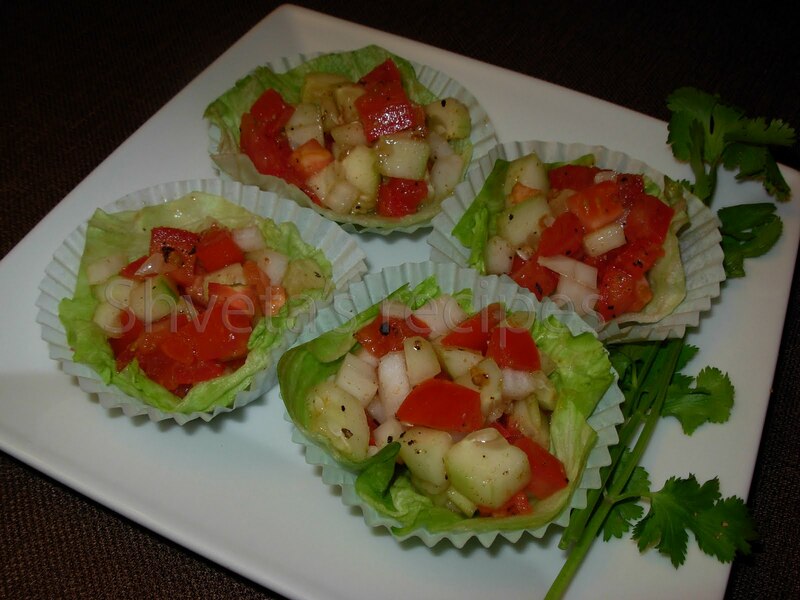 In a paper cup, line the lettuce leaf and fill it with the prepared salad mix. Repeat the process for the remaining 3 cups. Arrange all the four salad cups in a serving plate.